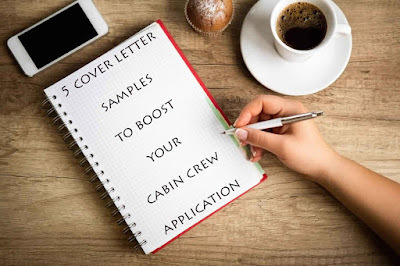 There are two types of cabin crew cover letters, those that work and those that don't! Think about it. When you send a job application to an employer or a recruiter, the first thing that they're going to be read is the cover letter. Therefore, it's the cover letter that creates the first impression. If the cover letter isn't up to standards, then your job application stands a good chance of going no further, no matter how good your cv/resume or job application form is. The cabin crew motivational letter is your opportunity to sell yourself and make a positive first impression. Get it right and increase your chance to make the shortlist! Many candidates forget to include the cabin crew cover letter when applying online. It's almost like forgetting a cake on a birthday party or publishing a book without a cover. The whole purpose of a cover letter is to summarize your resume which explains briefly who you're, your experiences and goals to become a flight attendant. There are several styles and ways to write a cover letter. It depends on the type of job that you are applying for. Here are some methods that you can follow to ensure that your flight attendant cover letter will help you to get the job that you desire. First, before you start to write your cover letter, you have to do some research on the company you are applying to work at. You need to find out what the mission of the company is, what their target audience is, what they do differently than other businesses, etc. This will show that you are actually interested in the job as a career and not just a job to get money and nothing else. This can get you the interview and then you will at least have a shot at the job. When you begin your letter, you need to start by letting the business know the reason you are sending them your resume. It should be two or three sentences long and list the name of the job you are applying for, but should merely state that you are applying for it and not go into details about where you saw the ad, etc. You can also put in why you are interested in the company and would like to have the job. Next, you should outline all of your qualifications and show how these match the employer’s requirements. This is important and can get you a heads up in advance. Then, in the next paragraph, you need to think of a sentence that will cause the prospective employer to want to hire you. You should also explain that you are also attaching your resume to the application and say when you are available to be interviewed. Be sure to proofread your letter and check for any misspellings or awkward sentences. Also, be sure to write your sentences in the active voice, not passive as this shows more strength. You will turn off a prospective employer if there are mistakes in your cover letter and won’t even get that all important interview. I set up five cover letter samples below to make your life easier and help you increase your enrollment chance. Chingare, 3 rd Street, 93Nigarakwa. I’m writing to express a great interest in the cabin crew position for your establishment. I enclose my CV for more information. I am confident that I meet cabin crew requirements and keen to learn more about this lifestyle. My teaching experience taught me a lot about organizing events and communicating with students. In addition to my travel journey that had open my eyes to new horizons and made lots of friendships along the way. Flying has been a long-term career aspiration and a lively dream which would combine my love of customer service and travel. I'm keen to work for a company with a great reputation and high profile like [name]. I believe I can be a great addition to the team by bringing hospitality, passion for the industry, flexibility, and motivation to manage a demanding work schedule. Thank you for your time and consideration. In case you do not have any suitable openings at the moment, I would be grateful if you would keep my CV on file for any future possibilities. I was excited to see your opening for a cabin crew position, and I hope to be invited for an interview with your prestigious company. My background includes serving as a 'customer service associate' within both call-center and retail environments. Most recently, I worked on the customer service desk for [Company Name], where my responsibilities included handling customer merchandise returns, customer service support, advising clients based on their needs and providing backup cashiering during busy periods. In my recent job, I demonstrated the ability to resolve a variety of issues and complaints such as customer disputes, personal complaints of other employees, pricing issues. I consistently resolve work problems by addressing the customer's needs by being polite and understanding. I am confident that I can be a flight attendant because I enjoy serving others and being part of their journey. Thank you for your time and I look forward to hearing from you. I’m writing to express a great interest in the cabin crew position for [Airline name]. I attached my resume for detailed information. As you can see, I have had extensive work experience in banking and multinational tourism industry, giving me varied skills and the ability to work with people from all walks of life. By nature, I'm very sociable and love to explore new cultures and places. I have already been to Germany, France, Austria, UK and the experiences alone for being in a multi-cultural environment is very rewarding. My colleagues and managers have eulogized me for my high level of interpersonal skills and being a good team worker. My stimulus includes learning new things and the challenge of meeting proposed objectives. The following are some other highlights of my personality and skills which will be an asset to your company. Customer service experience working with the multicultural populace. Confident communicator with outstanding interpersonal skills. Good sense of humor and having an open and warm approach. Hands-on experience in promoting new services and products to customers. Flexible approach with a special ability to handle emergencies. Furthermore, I have an excellent attention to detail that would enable me to cater to every passenger’s needs; a cool, calm and flexible approach that will get everyone to their destination carefully and safely. I sincerely believe that my determination and pre-existing skills will allow me to fit into your work environment and immediately start supporting the needs of your corporation. I am willing to relocate and able to attend any recruitment process at short notice. If you need any additional information in the meantime, I can be reached on mobile or via email. Also, below are two contact references to my current and previous manager. If you decided to choose the cover letter above, make sure that you've talked to your references about it and confirm all their contact information before hand. I’m writing to express a great interest in the cabin crew position for your company. See my attached resume for in-depth information. I am in my final year at [Example University], studying hospitality management. I have a long-standing experience in travel, tourism, hospitality, and marketing management, as well as public relation management. Cabin crew has been a long-term career aspiration and a lively dream which would combine my love of customer service and travel the world. My enthusiasm for pursuing a career in this area stems from my interest in working with people and satisfy the demand of guests in a service-oriented environment. I believe I can be a great addition to the team by bringing hospitality, passion for the industry, flexibility, and motivation to manage a demanding work schedule. Thank you for your time and consideration. In case you do not have any suitable openings at the moment, I would be grateful if you would keep my resume on file for any future vacancies. In response to the job advertisement published in XXXX on the date 01/01/2018, I am applying for the cabin crew role. I understand from the job advertisement that, your company needs some young and motivated employees for this position. I believe that I fulfill all the requirement for the job advertised and quite enthusiastic to explore this career. Over the past few years, I was fortunate to obtain linguistic skills, determination, and hard work ethics which is required by this line of work. I have spent the past 3 years in various customer service related positions, and would now like the opportunity to contribute those experiences and expertise to your company. In your post for a qualified cabin crew, you mentioned your need for versatile, responsible, hard-working, dedicated quality service professional, who are ready to join immediately. I believe that I can be a great addition to your team by bringing motivation, passion for the industry, flexibility and customer satisfaction. I look forward to speaking with you further regarding this position and starting a promising career that offers quality, professional customer service, dedication, and innovation. How to edit the cover letters above? I have put these 5 samples to give you an idea and you can copy whatever is suitable based on your personal experience and character. [Company Name]: change the yellow text according to the airline you're applying to. All in all, cover letters are very necessary tools that can help job seekers get their foot in the door. If you don’t write a good cover letter and it is too generic or has lots of errors in it, the employer will more than likely pass you over no matter how impressive your resume is or how qualified you are for the job. Therefore you need to write a targeted cover letter with no grammatical errors and gear it to each and every job you apply for if you want to get that chance to interview for your dream job. Drop a 'Thanks' in the comment section below as I appreciate your feedback. Nice and inspirational. But i still struggle with my own letter in here. Send us yours and we will review it :). Thank you so much! very helpful examples. your welcome. I didn't understand your question above? I do not have any job expirience. Will my cv stand out ? Yes if you write a proper cover letter and highlight your previous job skills as mentioned above. Good guide Yassine, thank you for the examples. I will use your tips for my cover letter. Your welcome dear. Wish you all the best. Im struggling with my letter, can you please help me and review my letter? Sure. You can reach me through the contact us page. Thank you! It was really really helpfull! Mention it in a way that you don't talk about how long it is.